Parasites are organisms that live at the expense of other organisms of a different species (the host) without being predators. Predators basically eat their prays, e.g. carnivores such as wolfs, tigers, etc. Parasites are usually much smaller than their hosts and don't eat them, but feed on them, causing them more or less damage or pain, but usually not killing them. Typical parasite examples are ticks, flies or mosquitoes that feed blood on livestock or pets. Parasites are a nuisance for the host, but usually not lethal, unless there are so many parasites on the same host that it is weakened to such extent that it dies. Obligate parasites cannot survive without their host: they need it for feeding or for reproduction. Typical example are ticks, mites, lice, flukes, etc. Most if not all of the veterinary parasites are obligate parasites. But there are also so-called facultative parasites, which may survive (i.e. complete their life-cycle) without a host, e.g. some flies that lay their eggs on carrrion where the larvae complete development to adults or, for the same purpose may infect wounds of living animals and cause substantial damage to them. There are some insects or worms that strictly speaking are not parasites but just a nuisance, e.g, houseflies. But in very high numbers, the nuisance may be considerable and have an impact on productivity of livestock operations. And they can also trasmit animal diseases. Prokaryotes: are those organisms whose DNA (the molecule that carries the genetic information) is not arranged in a nucelus inside each cell, but it is "swimming around" in the cell. Bacteria and viruses are typical prokaryotes. Prokaryotes are considered as being more simple or primitive than eukaryotes. There are quite a number of prokaryotes that "live at the expense of other organisms of a different species", i.e. stricktly speaking they are parasites. These prokaryotic organisms, including those that are parasitic are a topic of Microbiology, usually not of Parasitology. They are not considered in this site. Eukaryotes: are those organisms whose cells have their DNA arranged in a "nucleus" inside each cell. The nucleus is a kind of vesicle inside the cell and has a own nuclear membrane. Eukaryotes are considered as being superior and more developed organisms than prokaryotes. Eukaryotic organisms can be made of a single cell (so-called unicellular organisms or protozoans) or of many cells (multicellular organisms or metazoans). All "superior animals" such as mammals, birds, fish, insects, worms, reptiles, etc. are metazoans. There are also quite a number of eukaryotes that "live at the expense of other organisms of a different species", i.e. that are parasites, both among the metazoans, and among the protozoans. Metazoan parasites are e.g. insects, ticks, worms, etc. Protozoan parasites are e.g. those of the genus Trypanosoma that cause the sleeping sickness; those of the genus Plasmodium that cause malaria; and many other veterinary parasites such as Babesia spp, Theileria spp, etc. Parasitology is the science that deals with all these eukaryotic parasites. This site deals with the metazoan parasites., i.e. ticks, flies, mites, worms, flukes, etc. For the time being not with protozoan parasites. Many parasites do not only harm their hosts by feeding on them, but they also trasmit diseases caused by microorganisms such as viruses or bacteria. They are called vectors of such diseases. Among the veterinary parasites that live at the expense of their host many are at the same time vectors of diseases, e.g. ticks and mosquitoes. In fact, many important diseases of humans and animals are transmitted by parasites, e.g. malaria, yellow fever, sleeping sickness (trypanosomiasis), Chagas disease, river blindness, typhoid fever, plague, pox viruses, etc. Many parasites are capable of surviving on various host species, even very different ones. Some tick or fly species may feed blood on mammals, birds and reptiles. 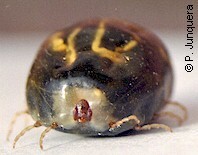 Other parasites have a narrower spectrum of hosts, e.g. only birds, or only ruminants, or only carnivores. A few parasite species are very host-specific, i.e. they can complete their life cycle only on one or two very close host species: it is the case of most lice species of veterinary importance. Veterinary (and human) parasites are usually classified into external parasites (= ectoparasites) and internal parasites (= endoparasites), depending on whether they attack the host outside or inside its organism. Typical ectoparasites are ticks, lice, flies, fleas, mosquitoes, etc. that remain outside the host. Typical endoparasites are roundworms, tapeworms and flukes (= helminths). However, there are both ectoparasites that penetrate to some extent into the organism of the host (e.g. warble fly and bot fly maggots, several mites species that get into the respiratory system, etc. ), as well as worms that remain on the skin of their hosts. This site presents the parasites of veterinary importance for livestock and pets grouped into ectoparasites and endoparasites. A good reason for this classificastion is that the veterinary medicines for the control of such parasites are classically divided into ectoparasiticides and endoparasiticides.